Please join us in welcoming Felicitas as the new Vice President of NM TESOL. Felicitas teaches ESL and Early Childhood Multicultural Education courses at UNM Valencia Campus. She has previously taught all levels from pre-school to university in California and has participated in cultural exchanges in Adult Learning in Mexico, Spain, Cuba, Indonesia, Malyasia, and Thailand. In addition to teaching, Felicitas has served as an administrator and has completed graduate coursework in ESL, Bilingual, Special Ed, Early Childhood, Adult Learning, and Education Administration. While we were sorry to accept the resignation of Amy Christensen, we are happy to have Felicitas on the Board of Directors. Save the dates: Professional development event November 5 and 6! NMTESOL and NMAEA are co-sponsoring a 2010 conference at the UNM Valencia campus in Los Lunas on Friday afternoon, November 5, and all day Saturday, November 6. Registration information and more details will be provided soon. Did you miss the BBQ? On Saturday, June 26, NMTESOL members gathered at the home of Treasurer Carolyn Kaltenbach and her husband Alexi Castillo (who is also a NMTESOL member) for a potluck picnic and BBQ. In addition to being a pleasant afternoon of good food and conversation with friends and colleagues, the picnic was the official announcement of the new NMTESOL logo. Marcus Furrow, designer of the winning logo and a student at the Digital Arts and Technology Academy charter school in Albuquerque, and his mother joined us. 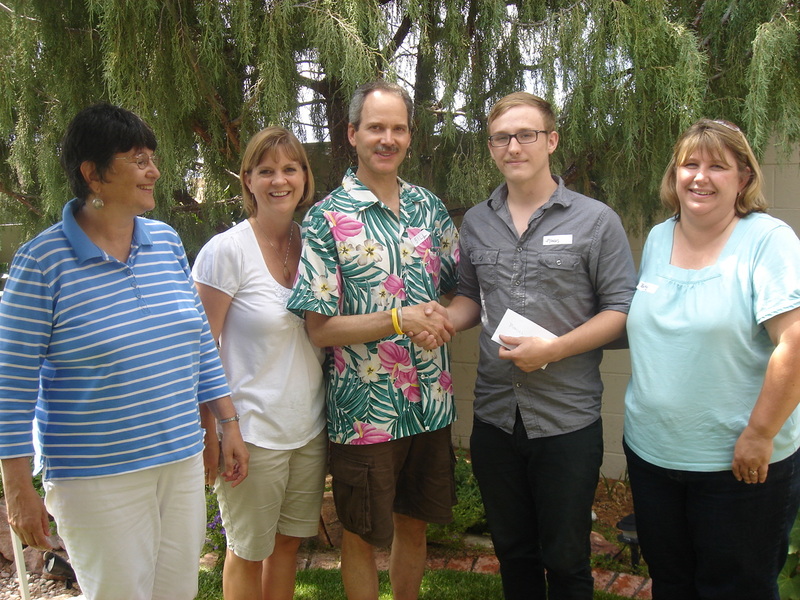 Board members presented Marcus with a check for $100, which was the prize offered in our logo design contest. Here’s a picture of Marcus receiving his check.